Our 40-hour, comprehensive Certified Mold Remediator (CMR) course will teach you how to remediate mold contamination for both large and small projects. You will learn how to contain and clean mold-affected areas, as well as how to find the source of the problem and repair it. 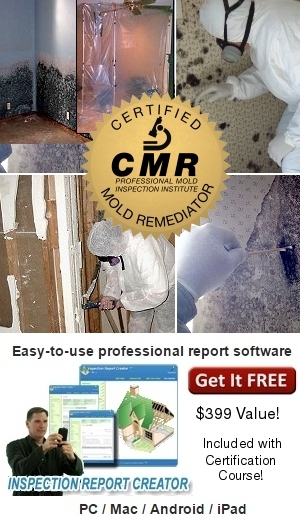 The course includes Mold Remediation Report Creator which you can use to develop the scope of a mold remediation project, calculate costs and determine a timeline for the job. When you finish the course and pass the final exam, you will be a Certified Mold Remediator (CMR) and possess the knowledge and skills needed to start a full or part-time business. Online Course Access and optional back-up CD, Mold Remediation Proposal Template, Online Flashcards & Testing, CMR Certification, Mold Remediation in Schools and Commercial Buildings (EPA), Toll Free Student Support.